State budget negotiations continue in Harrisburg as we work to craft a fiscally responsible spending plan. As Majority Leader of the State Senate, I am pleased that the Governor is committed to passing a budget in a timely manner so that schools and community organizations are not adversely affected. Last year, we were able to pass a budget that increased funding for education, held the line on spending and did not include broad-based tax increases. That is our goal again this year, and I believe the governor realizes there is no support for the massive taxes he proposed earlier this year. I believe state government, like taxpayers, needs to live within its means and I will continue to work toward a budget that reflects that priority. Authorizing grocery stores with a restaurant license to sell wine. Authorizing the direct shipment of wine to consumers from private wine wholesalers. Giving state stores more flexibility on when they can open and their hours. Ignition interlock legislation that I strongly supported was signed into law last month as Act 33 of 2016. The new law will require convicted drunk drivers with illegal Blood Alcohol Content (BAC) of .10 or greater to use ignition interlocks for at least 12 months. It takes effect in 15 months. The law will help to save lives and reduce repeat DUI ’ s while allowing first time offenders to drive in a safe and controlled setting. Statistics in states that have similar laws clearly show the implementation of ignition interlock devices for first-time offenders significantly reduce drunk-driving fatalities. According to statistics compiled by Mothers Against Drunk Driving, nearly 2 million drunk-driving attempts have been stopped with ignition interlock devices, including more than 78,000 instances in Pennsylvania between 2003 and 2015. 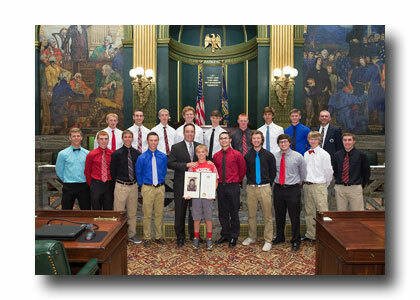 Congratulations to The Red Raiders of Bellefonte on the their PIAA Class AAA championship win over Susquehanna Township earlier this month at Medlar Field in Lubrano Park. It is Bellefonte’s first state title in baseball in school history. This talented group of kids from my home town showed a great deal of heart all season, battling back from a 1 and 7 start and brought home a prestigious award to our district and my home town. Prevent contracting the disease through the prompt and careful removal of the tick with tweezers, followed by application of rubbing alcohol to the bite area and your hands. The Centers for Disease Control and Prevention offer details on thediagnosis and treatment of Lyme Disease. Motorists are asked to steer clear of road crews, emergency personnel and law enforcement as they perform their jobs. In 2015, 23 people were killed in work-zone crashes. Additionally, there were 1,935 crashes in work zones last year, an increase from 1,848 crashes in 2014. Over the last five years, there were 9,117 work zone crashes and 105 fatalities in those crashes . 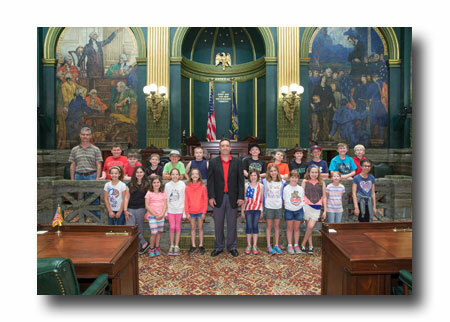 I joined 4th graders from Benner Elementary School in the Senate Chamber during their recent tour of the State Capitol.